Most of today’s authors use a pile of software and services to track their writing business. Google Calendar for scheduling, To-Doist for tasks, Excel to track promotions, a text file to keep notes, Buffer to automate tweets. There are dozens of options out there for every faction of publishing a book. Well, we feel your pain. We’re authors too. We got fed up with juggling tools that showed no interest in working well together. ReaderLinks is the first and only all-in-one tool for authors who want to simplify their business. I can’t juggle all of the tasks required to launch a book well. I can’t see what’s working and what’s not. There’s too much spinning of wheels and crossing of fingers. I need to recreate the wheel every time I launch a new book. All of those new links, to-dos and social media posts to craft from scratch. So we built a suite of tools that we can’t wait for you to try. At its core, ReaderLinks is a management tool. But because we’re authors building it for authors it’s not an exercise in theoreticals. Let’s break down ReaderLinks’ features in three categories: Publishing, Marketing and Link Tracking. In this post we’ll cover some of the publishing tools. How can ReaderLinks help me publish my book? 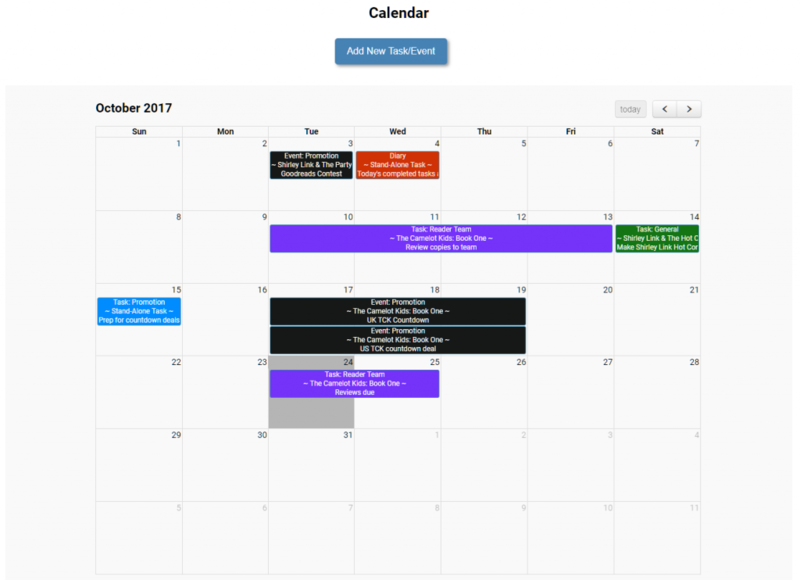 With the ReaderLinks Calendar you can track all of the tasks and milestones you need to by looking at the main calendar. Or you can go into your book and see what’s required just for that book. So you can get the big picture and the little picture with a click. There are 1000 tasks for every launch. It’s hard to keep track of everything, especially when you’re still marketing your back catalog! ReaderLinks’ Core Tasks feature helps you identify to-dos that always need to get done, no matter what. Carve out time with your editor. Give your cover artist the warning she needs to ramp up. Remind yourself to go wide after 90 days on KDP Select. If you know you’ll have to do this task every time you launch a book then make it a Core Task and the task will be assigned to every new book you publish. 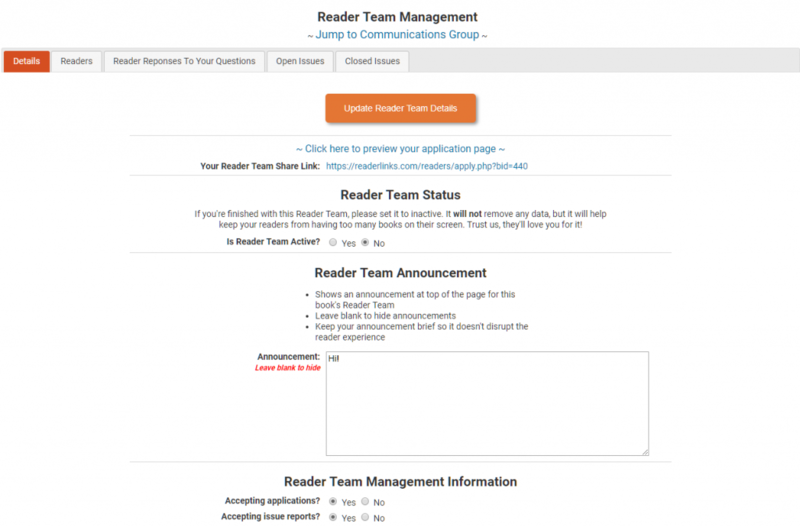 And finally, you can manage your ARC/Beta team with ReaderLinks’ one-of-a-kind Reader Teams tool. If you’re not familiar with Advanced Reader Copies (or ARCs) Teams, they give select readers access to your book before launch. Authors who build a team of early readers for their book are securing fans who will help them read the ARC, suggest edits, and then give it a review. It’s a wonderful process but it’s tough to manage, especially as teams can be large. But the Reader Teams tool will help by making it easy to invite people to join, track their performance, see all of the error reports in one place and act on them right then and there. No more cross-checking Excel! If you have any questions about how ReaderLinks can help your author business, join us on our Facebook page.